Find One (or ALL) of Sayon’s Event(s) to Attend This Spring! Registration – now open! and information here. The popular Maine workshop you don’t want to miss! And don’t forget weekly Beginning and Intermediate/Advanced Classes every Thursday night in White River Junction VT! Information here. Sayon Camara serving as the djembefola for his village during a recent celebration of the new wells recently drilled in the village. Thank you to the hundreds of you who made this possible! Drumming and dancing! Get the details and register here! Don’t fret if you missed Sayon’s last workshop in Maine because of the Columbus Day weekend. You don’t have to miss Sayon or his fall Maine workshop after all! That’s right, Sayon will be back in Wiscasset, Maine in 9 days on Friday + Saturday November 4 + 5 for a surprise pre-tour workshop! Get registered and detailed right here. Sayon Camara works with students. To get detailed information and register while the Early Bird price is still available click here! Last call to register for Sayon’s Intermediate/Advanced class in Newton MA at 7pm tonight! After a GREAT wrap on the West coast Sayon is ready to drum with East coast drummers and friends. Maine here he comes! We’ll be drumming on djembes and dounouns, Friday, Saturday and Sunday and adding dance to the Sunday afternoon drumming class of the traditional Kassa rhythm. Get ready for joy! 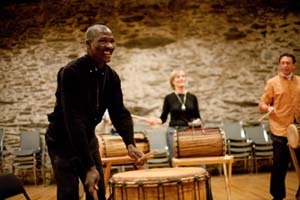 This June Sayon will be offering TWO West African Drumming & Dance workshops! One on the West Coast (click here for West Coast details/registration) and one on the East Coast (click here for East Coast details/registration). Registration is now open! 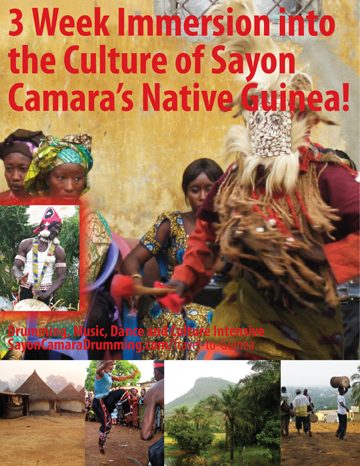 Dates Set for Travel to Guinea with Sayon! Travel to Guinea. Immerse yourself in the culture. Change. Sayon has set the dates! December 29, 2016 – January 18, 2017. Find the classes nearest you on the Classes page! Let’s give Sayon a great send off to his home in Guinea with this final 2015 workshop! This is a wonderful chance for students from local classes and workshops around New England to play together, growing community and family while sharpening your Malinke drumming skills! Sayon Teaches In Vassalboro ME on Sunday 9/27! Gentle, clear teacher and master djembefola Sayon Camara will be teaching a workshop in Vassalboro ME this Sunday, September 27! The workshop is for everyone who has ever thought about or had a desire to hand drum to intermediate to experienced players. Sayon will keep everyone engaged at their individual playing level and help you get to the next step. A drummer and human being of his caliber is a rare gift anywhere in the world. Not to be missed! Pre-register for this workshop – email Sayon at sayoncamaradrumming@gmail.com or call 802 779 4914! 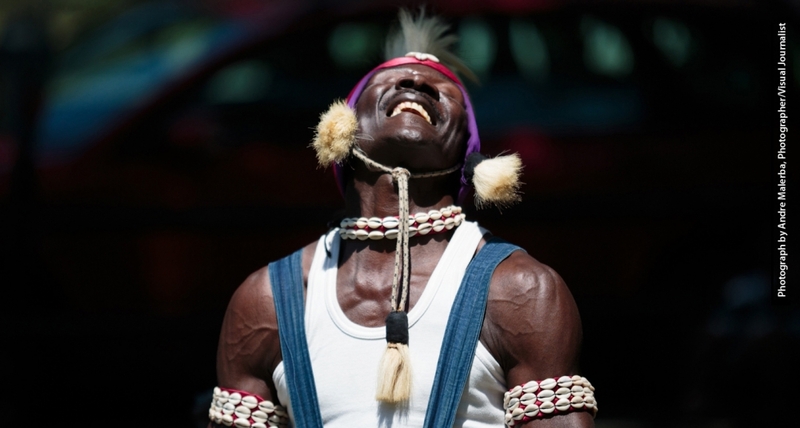 Inspired master djembefola Sayon Camara of the traditional Guinean artisanal family of djembe makers and drummers is returning to Maine in just 7 days to teach students the rhythms of his people! Pre-register here for this workshop! Get into Laconia NH’s Multicultural Festival with Sayon & Landaya. 1:30 and 2:30 pm! This Saturday 9/12. Just 2.5 Weeks Until Sayon’s Final 2015 Workshops in Maine! Catch him in Wiscasset (register here) on Friday and Saturday September 25 and 26.
in Hallowell in the Augusta area (register by calling 802 779 4914 or emailing Sayon) on Sunday September 27. Attend all three days for a complete Sayon experience! It will blow you away and might even take your drumming to the next level and your being to a more joyous place! Good for your well being. Register now for Early Bird Pricing at both locations! Save on the third day when you sign up for all three days – call 802 779 4914 or email Sayon. Full details on both workshops here.